A pragmatic sanction is a sovereign's solemn decree on a matter of primary importance and has the force of fundamental law. In the late history of the Holy Roman Empire it referred more specifically to an edict issued by the Emperor. When used as a proper noun, and the year is not mentioned, it usually refers to the Pragmatic Sanction of 1713, a legal mechanism designed to ensure that the Austrian throne and Habsburg lands would be inherited by Emperor Charles VI's daughter, Maria Theresa. Pragmatic sanctions tend to be issued at times in which the theoretically ideal situation is untenable, and a change of the rules is called for. The Pragmatic Sanction of Justinian I, promulgated in August 554, on the reorganization of Italy following the Gothic War. The so-called Pragmatic Sanction of Louis IX, purporting to have been issued in March 1269, regarding various clerical reforms, was a forgery fabricated in the 15th century. The Pragmatic Sanction of Bourges, issued on July 7, 1438 by King Charles VII of France, limited the authority of the pope over the Church within France. The German Pragmatic Sanction of 1439, issued by German ruling princes March 26, 1439, accepted some of the decrees of the Council of Basel with modifications. It has been argued that the name Pragmatic Sanction is not properly applied to this document, as it was issued by princes subordinate to the emperor without the emperor's endorsement. The Pragmatic Sanction of 1549, issued by Holy Roman Emperor Charles V, established the Seventeen Provinces as an entity. The Pragmatic Sanction of 1713 issued by Emperor Charles VI on April 19, 1713, by which the Habsburg hereditary possessions (Austria, Bohemia, Hungary, and various other smaller lands) were allowed to pass to a woman (specifically Maria Theresa) if Charles VI had no male heirs. The Croatian Pragmatic Sanction of 1712, passed by the Diet of the Habsburg Kingdom of Croatia and predating the Austrian decree, allowing the Croatian throne to pass to the female line of the House of Habsburg. The Pragmatic Sanction of 1723 passed by the Hungarian Parliament, accepting female inheritance in the Kingdom of Hungary. Charles VI had permitted Hungary to revert to elective monarchy should he die without a male heir; this instrument signalled the Hungarian parliament's acceptance of his choice of successor. The Pragmatic Sanction of Naples, issued October 6, 1759, by King Charles III of Spain, governed the succession to the thrones of Naples, Sicily, and Spain, and forbade the union of Spain and the Two Sicilies. The War of the Polish Succession (1733–35) was a major European war sparked by a Polish civil war over the succession to Augustus II, which the other European powers widened in pursuit of their own national interests. France and Spain, the two Bourbon powers, attempted to check the power of the Austrian Habsburgs in western Europe, as did the Kingdom of Prussia, whilst Saxony and Russia mobilized to support the eventual Polish victor. The slight amount of fighting in Poland resulted in the accession of Augustus III, who in addition to Russia and Saxony, was politically supported by the Habsburgs. Charles VI succeeded his elder brother, Joseph I, as Holy Roman Emperor, King of Bohemia, King of Hungary and Croatia, Serbia and Archduke of Austria in 1711. He unsuccessfully claimed the throne of Spain following the death of his relative, Charles II, In 1708 He married Elisabeth Christine of Brunswick-Wolfenbüttel, by whom he had his two children: Maria Theresa, the last Habsburg sovereign, and Maria Anna, Governess of the Austrian Netherlands. The Pragmatic Sanction was an edict issued by Charles VI, Holy Roman Emperor, on 19 April 1713 to ensure that the Habsburg hereditary possessions, which included the Archduchy of Austria, the Kingdom of Hungary, the Kingdom of Croatia, the Kingdom of Bohemia, the Duchy of Milan, the Kingdom of Naples, the Kingdom of Sardinia and the Austrian Netherlands, could be inherited by a daughter. The Emperor of Austria was the ruler of the Austrian Empire and later the Austro-Hungarian Empire. 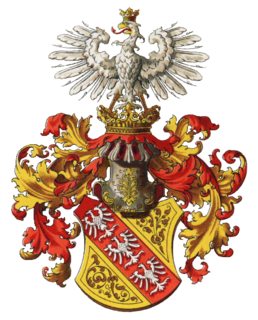 A hereditary imperial title and office proclaimed in 1804 by Holy Roman Emperor Francis II, a member of the House of Habsburg-Lorraine, and continually held by him and his heirs until Charles I relinquished power in 1918. The Peace of Vienna was a series of four treaties signed between 30 April 1725 and 05 November 1725 by the Habsburg Monarchy, the Holy Roman Empire, and Bourbon Spain; the Russian Empire later joined the newly-found alliance in 1726. The signing of this treaty marks the founding of the Austro-Spanish Alliance and led the Fourth Anglo-Spanish War (1727-1729). This new alliance thereby removed Austria from the Quadruple Alliance. In addition to a formation of the new partnership, the Habsburgs relinquished all formal claims to the Spanish throne, while the Spanish removed their claims in the Southern Netherlands, and a number of other territories. The grand title of the Emperor of Austria was the official list of the crowns, titles, and dignities which the emperors of Austria carried from the foundation of the empire by Francis II, Holy Roman Emperor's imperial proclamation of August 11, 1804 until the end of the monarchy in 1918. The Article 7 of the Sabor of 1712, better known as the Pragmatic Sanction of 1712, was a decision of the Croatian Parliament (Sabor) to accept that a Habsburg princess could become hereditary Queen of Croatia. It was passed against the will of the Diet of Hungary, despite the Kingdom of Croatia's centuries-long association with the Kingdom of Hungary. The resulting strife with the Hungarian officials ended with the legal recognition of the Croatian Parliament's sole jurisdiction over internal Croatian affairs. The Pragmatic Sanction is thus considered one of the most historically important decisions of the Croatian Parliament, and is recalled in the preamble of the Constitution of Croatia. The imperial election of 1742 was an imperial election held to select the emperor of the Holy Roman Empire. It took place in Frankfurt on January 24.